Olaparib (Lynparza) may become standard follow-up therapy for women with newly diagnosed ovarian cancer that has a BRCA mutation. On the strength of the results of a major international clinical trial, there is now a new standard of care for patients with an advanced form of ovarian cancer who have responded to initial chemotherapy. The trial, dubbed SOLO-1, found that these patients — newly diagnosed with ovarian cancer that carries a mutation in the genes BRCA1 or BRCA2 — had a 70 percent lower risk of dying or having their disease worsen if they received the drug olaparib rather than a placebo after completing their chemotherapy. Olaparib (trade name: Lynparza) is a PARP inhibitor, which works by interfering with cancer cells’ ability to repair damage to their DNA. In tumor cells whose ability to repair DNA damage is already impaired because of BRCA mutations, olaparib can cause so much genomic damage to build up that the cells self-destruct. 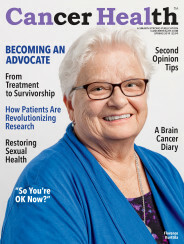 Olaparib has previously received U.S. Food and Drug Administration (FDA) approval as a “maintenance” therapy — used to prevent a worsening or recurrence of cancer following front-line treatment — for patients with recurrent epithelial ovarian, fallopian tube, or primary peritoneal cancer who respond to platinum-based chemotherapy regardless of whether the cancer tests BRCA-positive or -negative. This article was originally published on January 25, 2019, by Dana-Farber Cancer Institute. It is republished with permission.